Alizee hotesses agency was established in 1999 by a professional bringing more than a decade of experience in corporate reception, event and management. 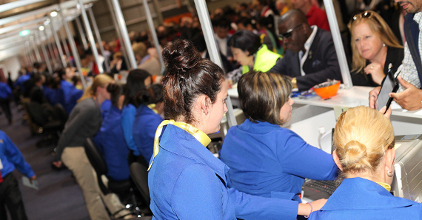 We offer host and hostesses for your various benefit in enterprise or event : fairs, congress, support or interpreting. We provide innovative solutions and cost-effective solutions with a highly trained professionals. In an increasingly competitive world, service and professionalism is a priority in any business strategy. Thanks to a solid organization and efficient logistical resources, our staff can be deployed anywhere in France or abroad. You’re arranging a fair, congress or any other event and you’re needing host or hostess for the reception, welcoming clients, managing cloakroom, promotional marketing, client’s accompaniment or any others services and skills ? Discover in details our event offer or fill directly our on line quote request. You’re needing staff in the daily work in order to manage the client’s reception at the business premises or for the switchboard ? Alizee agency provides a motivated and invested staff. We provide a staff replacement in case of sick leave or absence. An outsourcing of your reception for a daily quality service. For more information, find our business reception services webpage or ask our quote request on line. Our staff will promote your podium, event, contest and products. We provide hostesses for your product launch, distribution of samples and product’s value. We distinguish ourselves from the competition through a qualitative approach. Alizee agency is a national hostesses agency based in the 9th arrondissement of Paris. Our benefits happen on Paris area but also on all the French territorie, whether event, animation or enterprise’s reception in your company. By making your application online ! You want to organize an event that requires qualified people, individual services, customized services ?